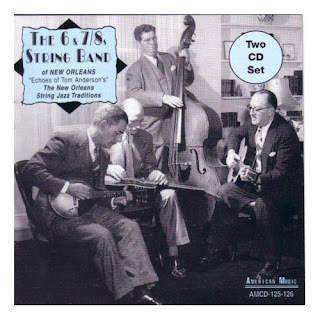 Earlier Hans Koert introduced the readers of the keepswinging blog to the great Six & Seven Eights String Band of New Orleans in a blogentry that also mentioned the then available 17 recordings of the group on the Folkways label. The blog had some comments from ardent readers concerning the exact recording dates of the Folkways issue that included material recorded by Samuel Charters in the mid-1950s, but it was not until a little later that the question about recording dates would be solved intermediately with the release of a cd by 504 Records that had the same material as the Folkways-issue plus a couple of additional sessions and in fact stated the dates of recording. I supplied this info in another blogentry after having aquired the cd. A few details about the band from Samuel Charters' sleeve notes summarize the story of this remarkable branch of New Orleans jazz tradition. Edmond Souchon (g, ldr) organized the band from the beginning in 1911 when he, still a schoolboy, would practice string band music together with two friends, the brothers Harry Reynolds (mandolin) and Bob Reynolds (g), in after-school sessions at the brothers' home. The three friends were ardent amateurs and tried to capture the sounds of the various jazz bands active in New Orleans at the time and transfer these impressions to their stringed instruments, thus creating a different sound but played with the same concept of collective performance as the common brassband jazz of the day. However, string band music was common in New Orleans at the time, although no recordings are available, but it is known that the famous Tom Anderson's café of Storyville had a string trio of mandolin and two guitars performing regularly in the backroom. The boys may have learnt tips and tricks from such an ensemble i.e. by offering drinks in return (- at least this is what is assumed in the sub-title and notes of the 2 cd-set, "Echoes of Tom Anderson's"). 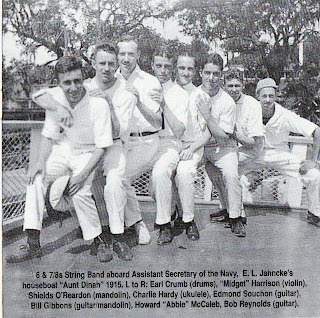 When Edmond Souchon later entered the Tulane University as a student, he met Bernie Shields, who played the Hawaiian guitar, and from around this time the 6 & 7/8s string band came together as a more or less organized group of fellow students and friends. They took their name from their seventh member, violinist Hilton "Midget" Harrison, who was considerable shorter than the other six (- a photo of the band 1915 from the cd sleeve notes is shown above). Samuel Charters further states in the sleeve notes: "Edmond [Souchon] recalled that when the band was most active he would see another musician practicing the mandolin on his porch across the street. 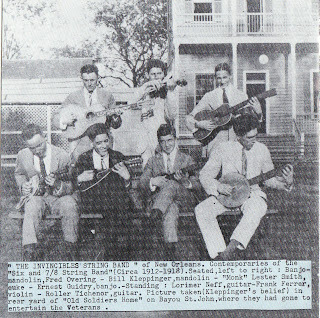 It was Bill Kleppinger, who played with his own band, the Invicibles [see photo above]. When the United States entered the first World War in the spring of 1917, Kleppinger, Souchon, and two other members of the 6 & 7/8s found themselves in the same artillery battery, and began playing together. After the war, most of the musicians scattered. Edmond was studying medicine in Chicago and Bernie [Shields] was in South America. Bill [Kleppinger] continued playing with the Invicibles, which also included [bassist] [Frank] Red Mackie, but when the band changed to dance instruments to become The Owls, Bill [Kleppinger] dropped out. Edmond called him, and they began playing as a duo, though only for themselves. In the late 1920s Bernie [Shields] returned to New Orleans and joined them, and two or three years later Red [Mackie] became their permanent bass player." 25. A Handful Of Cards, 26. Gettysburg March, 27. Lover Come Back To Me, 28.“A” Rag, 29. Liebenstraum. Tracks 10 to 25 Charles Hardy Jnr. (ukulele and voc.13), Edmond Souchon (guitar and voc.17 & 22). Possibly Frank “Red” Mackie bass on 24. Tracks 26 & 27 “The New Orleans Owls” featuring Rene Gelpi (banjo) and Lester Monk Smith (ukulele). 1. That Old Gang Of Mine, 2.Floating Down That Old Green River, 3. High Society, 4. Who’s Sorry Now, 5.Tiger Rag, 6. Tico Tico, 7. Up A Lazy River, 8. Donna Clara, 9. When The Saints. Labels: "six and seven eights string band of new orleans"